The three men were in a back room in the house of Patrick Kelly, brother of John James, when the explosion blew away part of the walls and roof. 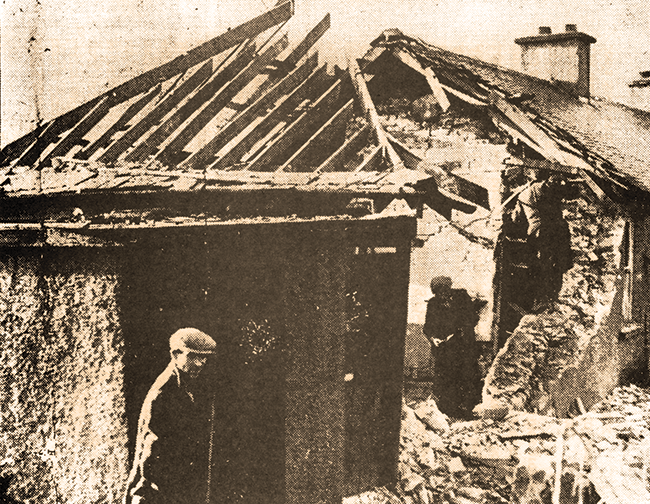 On 28 November 1938, IRA Volunteers blew up six customs posts along the border in Counties Armagh and Fermanagh. 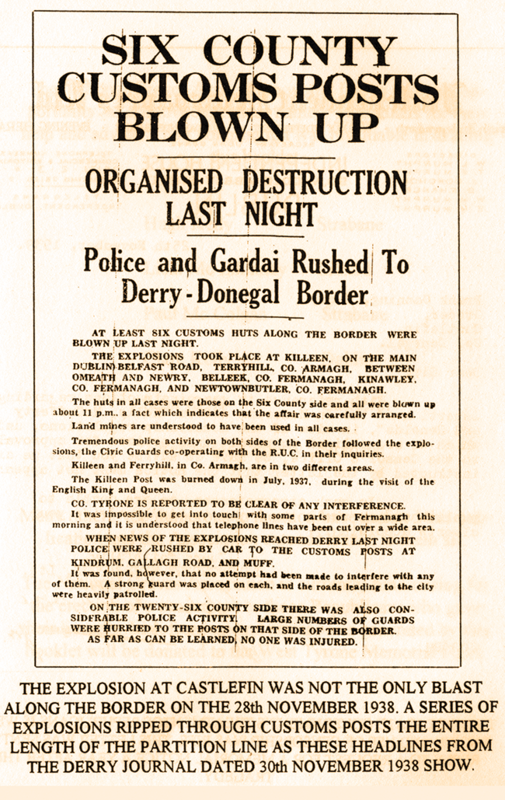 Two other posts - at Clady and Strabane in Co Tyrone - were also to have been demolished that night but the bombs to be used exploded prematurely, killing three Volunteers at Stranamuck, near Castlefin, Co Donegal. Comdt John James Kelly and Staff Capt James Joseph Reynolds were killed instantly and Comdt Charles McCafferty died a few days later in Lifford Hospital. The three men were in a back room in the house of Patrick Kelly, brother of John James, when the explosion blew away part of the walls and roof. The exact cause of the premature explosion has never been discovered, though Patrick Kelly said later that the men realised that the proposed time of the Strabane explosion coincided with the coming home of Strabane people from the cinema in Lifford. The Volunteers decided to change the time on the timing device and in doing so they caused the explosion. The three men who died were experienced Volunteers. John James Kelly's father had been a Fenian and he himself was raised in the Fenian tradition. He was recruited into the IRB at an early age and formed a group of Irish Volunteers in Clady. He took part in many operations during the Tan War and was arrested and imprisoned in England. On his return he took the Republican side in the Civil War and saw action against the Free Staters. John James Kelly was a man of the left - he spoke often to his son about Lenin. In the 1920s and 30s, because of his Republican views, he found it difficult to make a living but he remained in the IRA and was elected to its Executive Council. He was 48 years old when he died. Charlie (though he preferred to be known as Cathal) McCafferty was OC of the IRA's 1st Tir Conaill Battalion (which covered East Donegal and parts of West Tyrone) at the time of his death. He was born in 1910 and he too joined the IRA at a young age. In 1933 he was arrested and sentenced to six months in Derry Prison for possession of firearms. He worked as a barge loader on the Strabane-Derry Canal and he was known as a quiet man with an abiding interest in the history and folklore of his area. Jimmy Joe Reynolds was from Leitrim. He was the OC in that county and had been for a time OC of Britain. He had been sent to Donegal as the representative of the IRA's General Headquarters Staff and it was he who transported the bombs - three in all - to Stranamuck. Jimmy Joe had been active in the IRA for many years. 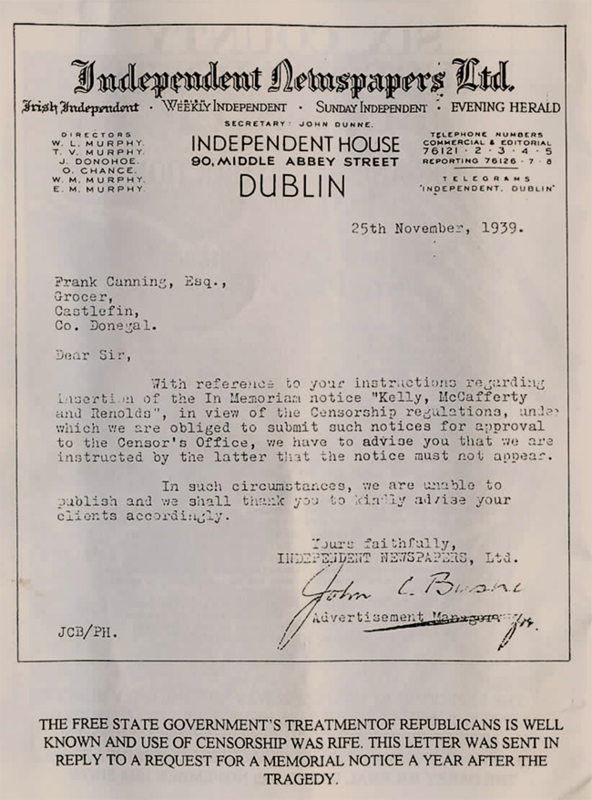 In 1935 he was charged along with six other men, including his twin brother, John Joseph, with the assassination of a rack-renting landlord, More O'Farrell, at Edgeworthstown, Co Longford. After two trials the case was dismissed and there were bonfires for fifty miles around to celebrate their escape from the Free State hangman. All three Volunteers received huge funerals with full IRA honours. They were buried eighty years ago this week.